Leading well involves a fine balance of demanding excellence and striving for results from co-workers while trying to build and maintain personal relationships. According to Michael Ballé and Freddy Ballé in “Lead with Respect,” what leadership boils down to is the relationships that are formed and how challenges and problems are solved through those relationships. This book covers leadership concepts and reinforces the importance of relationships in strong leadership. 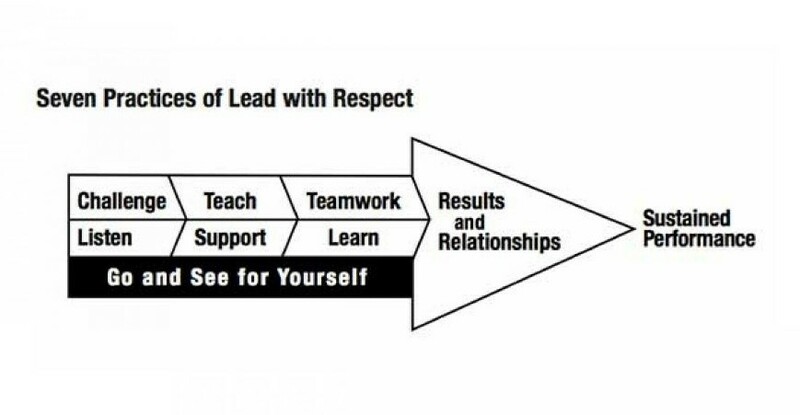 The Seven Practices of Lead with Respect, as shown in the diagram below, are: Go and See, Challenge, Listen, Teach Problem Solving, Support, Teamwork, and Learn. These seven principles, once put into practice consistently, will bring results to the organization along with relationships, ultimately resulting in sustained performances. As the foundation of the lean practice, Go and See is about leading the group by seeing the actual situation and meeting with people one-by-one to learn, challenge and support them. How can you expect to lead people through a project or issue when you haven’t seen what is going on for yourself? Instead of telling people what to do, challenge them to come up with a clear description of the problem, criteria for a solution and the expected pace of progress. If you’re talking, that doesn’t mean you’re listening. Understand the barriers, see the obstacles from their perspective and empathize with them in moment of discouragement. Understanding your coworkers doesn’t mean you’re agreeing with them, you are simply acknowledging who they are and what they are thinking in the moment. How can you better develop your employees’ abilities to analyze and solve problems on their own? This requires constant coaching, but also means knowing when to give people space to think for themselves. If you’re always solving the problems for them, they’re not learning! How can you encourage people to feel responsible for the problems they encounter and support them in trying out new ideas? Is your reaction supportive even when the ideas fail? Develop people’s individual skill in working with each other. This includes communication skills, how to have difficult conversations, how to understand learning styles, etc. As you go through different challenges with your team, what are key takeaways you can put in your back pocket for next time? Learning is essential to growing in your home and work life. As you look at these principles, which ones are you already comfortable doing? What is one that you need to work on? As stated by Michael and Freddy Ballé, “People have the right to succeed. Every person has the right to succeed every time they do their job, and they also have the right to have a successful career. When people feel successful in their job, they’re motivated to come to work and give it their best.” These principles will allow you to create better relationships and environments where employees feel successful and welcome. As a leader, it’s up to you to help your people succeed and reach their goals. Go make a difference today!